Light plays an active role in creating an impactful scenic design and dynamic spaces on a visual level and giving unique and special shapes to a room’s atmosphere. Colours, shades, lights and shadows are factors that give illumination the power to change our perception of space. For this reason, choosing the wrong lamp would mean ruining the observer's visual experience. Taking care of all your lighting project aspects will help you avoid making false steps. 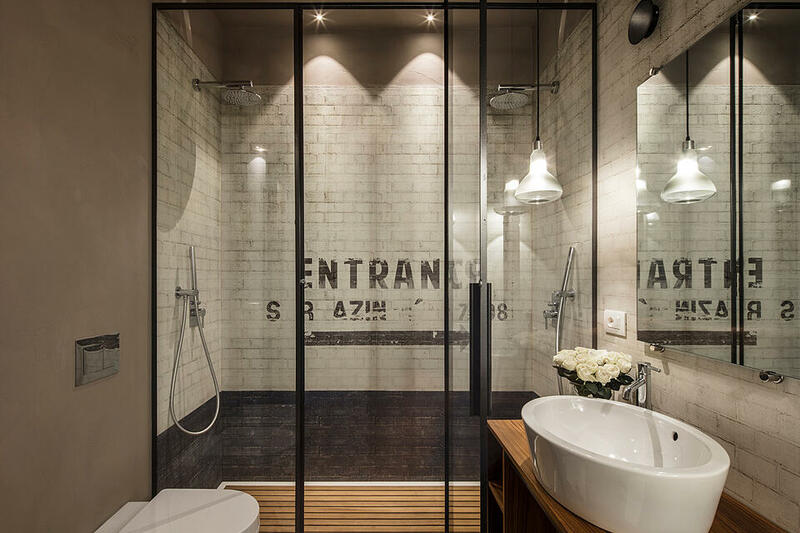 Let's look at the design of private houses as an example: in this situation, often the illumination of certain areas is not fully exploited, and the bathroom is a typical example. 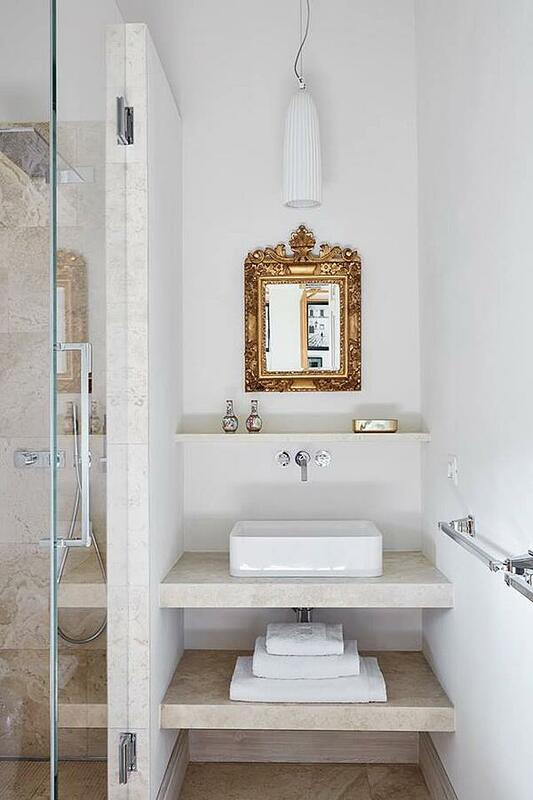 Each area of the house deserves equal attention as well as the bathroom. Over time the use of this space has changed and so has its role in the home. From a simple service unit, the bathroom has become a small temple of relaxation and personal care. That's why the ideal bathroom lighting should guarantee a perfect combination of functionality and style. By using appropriate lamps that provide greater comfort and visibility to users and at the same time enrich the environment on an aesthetic level. You will also discover that using lamps that provide optimal lighting levels for the bathroom will not only ensure comfort but will also make smaller spaces look larger. The quality of bathroom lighting is measured above all in practicality and design. 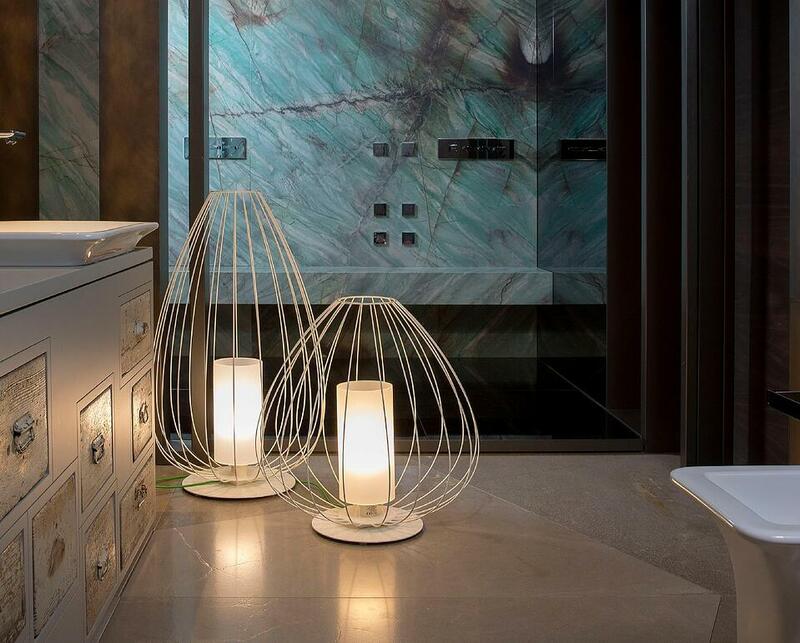 Form and style are certainly important elements in the characterisation of a room, but functionality is the aspect that should be taken into consideration first and developed to illuminate the bathroom correctly. Before deciding where and how to place the light points, do not forget about the sources of natural light that the room has (windows and balconies, for example). Begin by outlining the type of atmosphere designed for this area. Make sure that the solution chosen for ambient lighting is adequate to the size of the bathroom, which can enhance or expand its spaces. Make sure that those who use the room can carry out every activity in total comfort, illuminating the areas most frequently used such as the mirror, sink, shower and bathtub. Be sure to add a touch of personality by highlighting details and decorations using light points distributed along the walls and ceiling. The fresh and soft touch of natural light added to the artificial light, distributed on several levels, will make the bathroom lighting more pleasant and efficient since each corner will enjoy excellent light gradations. Putting on makeup or combing your hair are just some of the countless daily actions performed in front of the mirror. To do them as quickly as possible and in total comfort, optimal levels of task lighting are required. Unit of measurement that allows you to set gradations of warm light or cold light. For the bathroom, we recommend using light bulbs between 2700 and 3000 Kelvin to establish a more intimate atmosphere. The most suitable value to enjoy greater colour visibility should be set between 90 and 100. Even lamps with the most potential lack efficiency if put in places that are incorrect or impractical for their use. 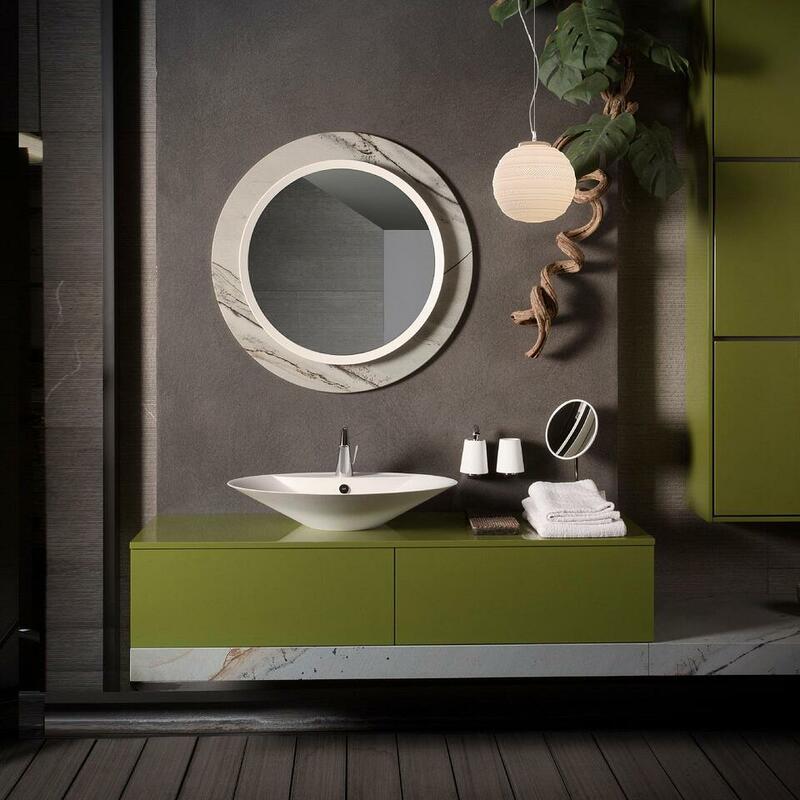 In this regard, purchasing mirrors with integrated lighting applied on each side or the use of ceiling lights and appliqués to better illuminate the sink and mirror , the real protagonist of this room, are often recommended. Karman has instead thought of different types of suspension lamps to carry out this task. Particular signs: a tube and a joint. Nando is a creation by Luca De Bona and Dario De Meo. A suspension lamp that is the child of the current industrial style, whose lines express total cleanliness and minimalism. You can choose the colours of Nando yourself: white, black or, for those who want to take a chance with a dash of audacity, gold. An endless expanse of sand and then a blunder of ethereal light, Sahara. A ceramic structure that takes on four different forms, unique and evocative. The green colour generates memories linked to nature and its intense nuances, while the white transport us to distant, magical islands. Sahara is a suspension lamp that lends itself to illuminating the mirror and sink, at the same time serving as a sculptural decorative element. A direct and intense light, we are talking about Eolo, one of the seven models of the Settenani collection signed by Matteo Ugolini. The shape changes in each lamp, becoming a distinctive feature for each element of the collection. There are two colours available: grey, which recalls the natural colour of raw cement; black, intense and eccentric, which gives greater charisma to the lamp. Idea, intuition, renewal: this is the process that led to the birth of Makeup, as well as the restyling of the classic light bulb with features more in step with the times. Made in several versions, as a suspension lamp, it reaches high levels of functionality ensuring optimal task lighting. You could apply a single Makeup lamp or combine multiple elements. By taking advantage of the many different models and shapes of this lamp, you will provide the observer with a more dynamic visual impression. 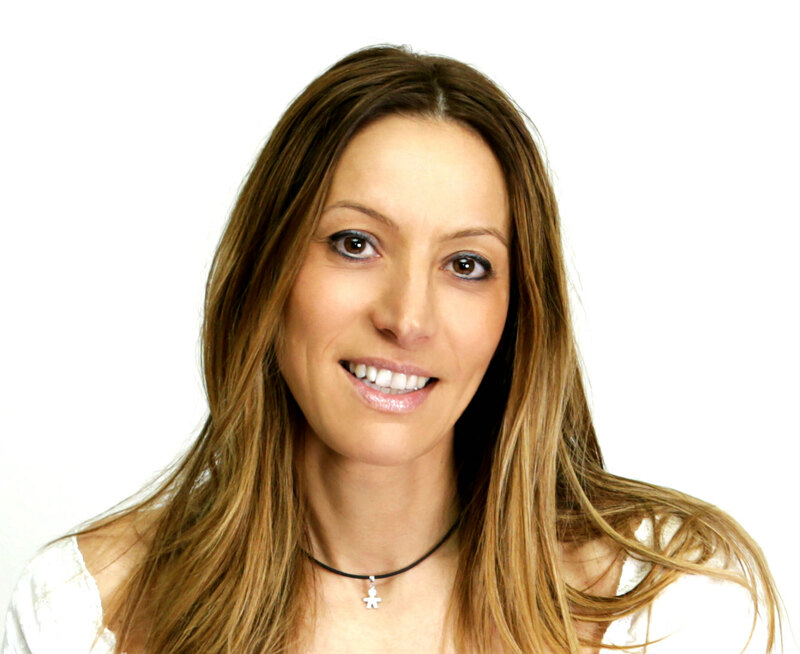 Dharma comes from an idea by Edmondo Testaguzza. It is the result of cement processing that gives birth to simple but strongly evocative forms. This lamp is an invitation to follow an unexplored path but, instinctively, right and safe. 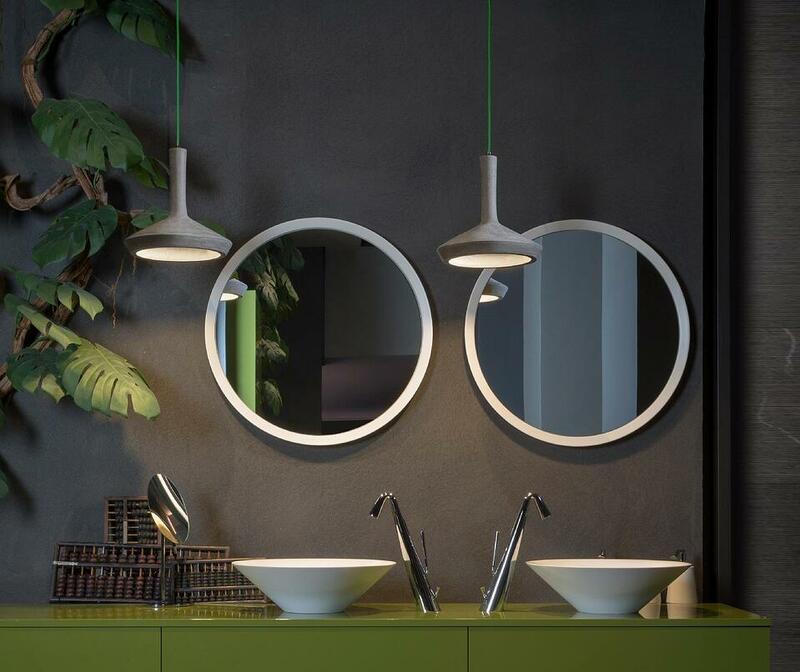 Even this time a simple suspension lamp presents itself as the most suitable solution for ensuring a direct light source that falls from the mirror onto the sink. An idea of light that has its roots in the concept of old and profound affection and loyalty called "friendship". Braille was created with the aim of paying homage to the link between designer Matteo Ugolini and the founder of Karman Davide Diamantini. The stories of two longtime friends reproduced on white frosted glass. Anecdotes told in a complicated language, sometimes indecipherable yet simple and universal like friendship: all this is Braille. Everyone knows how to illuminate these areas of the bathroom, but few can do it with a touch of elegance and authenticity. 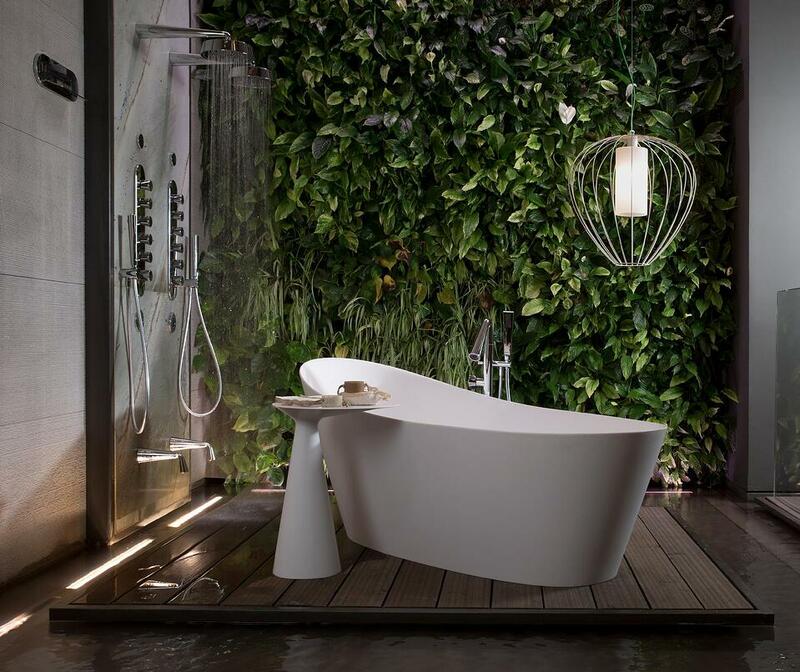 Karman has designed different suspension lamp models to decorate and supply the shower and bathtub area with ambient lighting and task lighting. A design with industrial taste, white ceramic and floral decorations that make the structure more graceful and romantic. We are talking about Work in progress: an original and impactful suspension lamp. Designed by Matteo Ugolini, it is suitable for illuminating the most intimate environments and can be applied individually or as a composition with several lamps. A lampshade in white linen and shiny bronze-coloured metal wire, it is the modern reinterpretation of the ancient Chinese lanterns made by Matteo Ugolini. Cell is a metal cage from which delicate light is released, perfect for enjoying a few moments of relaxation in the bathtub. Different solutions in a style that can illuminate and set the mood of the room in equal measure, simply and harmoniously. You could fill in the empty spaces with floor lamps, for example. By doing so you will enrich the bathroom decor and add an extra light source in one move. Do you want to add a focal point to the bathroom? Then Via Lattea is ideal for your bathroom lighting project. Its structure in natural cement is reminiscent of the old-fashioned bottles, in a not too distant time, for transporting milk. 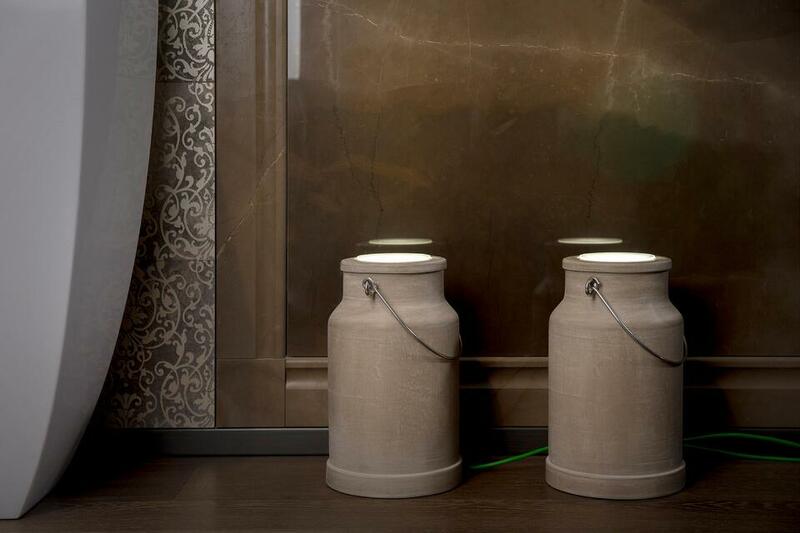 A strong and curious metaphor made concrete by the duo Bizzarri Design, which has every intention to make the light appear as a necessary good transported directly into the home or where it is needed. Versatile and also suitable for decorative lighting, we find Cell among the possible choices, this time in the floor lamp version. Like a lantern in the dark, this lamp guides and fascinates the observer. 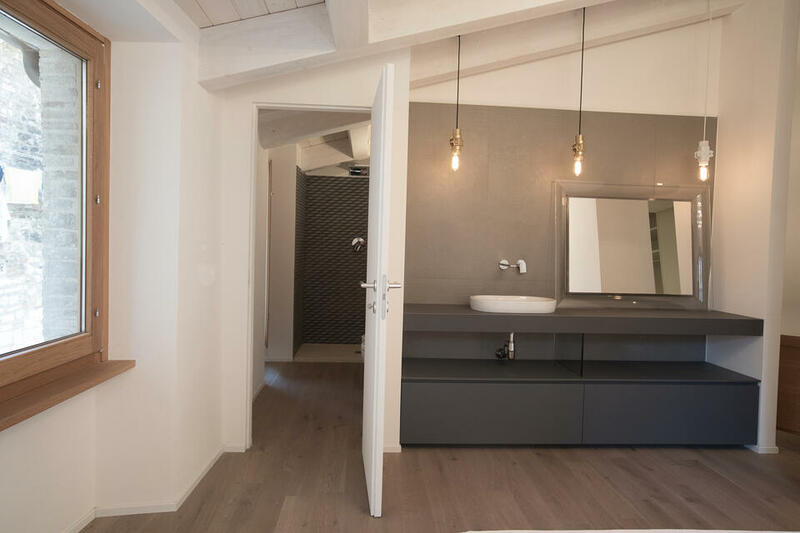 The main objective of lighting design projects for the bathroom is to create lighting solutions that can put the user at ease so that they can experience this particular room of the house in total comfort day by day. Pleasant stay and comfortable visibility. This is the synthesis of the experience that everyone would like to have in a bathroom. The lighting solutions chosen for the bathroom should give a visual and emotional impression, always pleasant and of great quality. Developing aspects such as safety and functionality will give your lighting design success and reliability. We know that ambient lighting is only the first step in providing each bathroom area with adequate light levels. Every level of structured lighting is essential for being able to move freely within the room and to perform the daily rituals of personal care without obstacles. 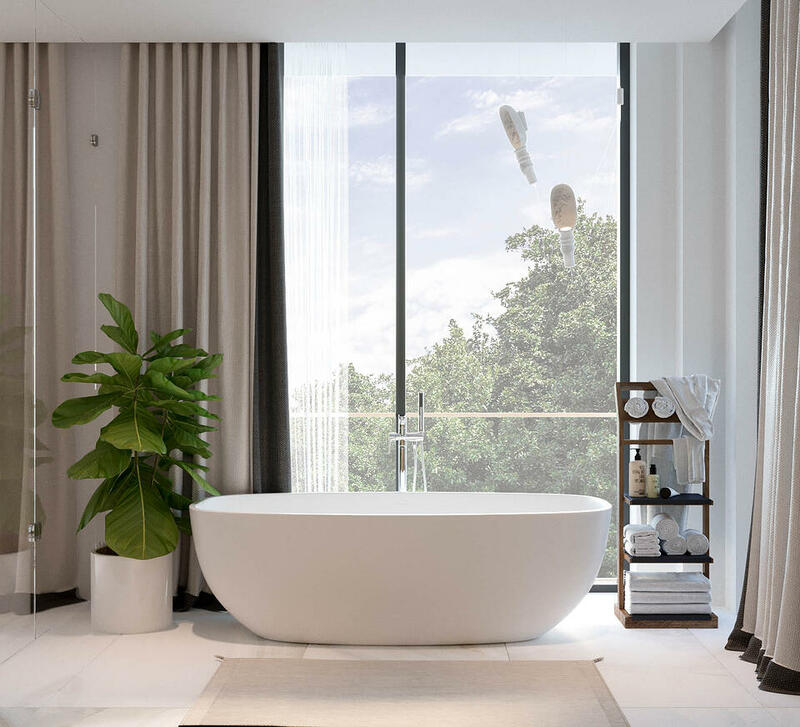 Therefore, different solutions for the bathroom will make this corner of the home an oasis of well-being, practical for use and aesthetically satisfying. 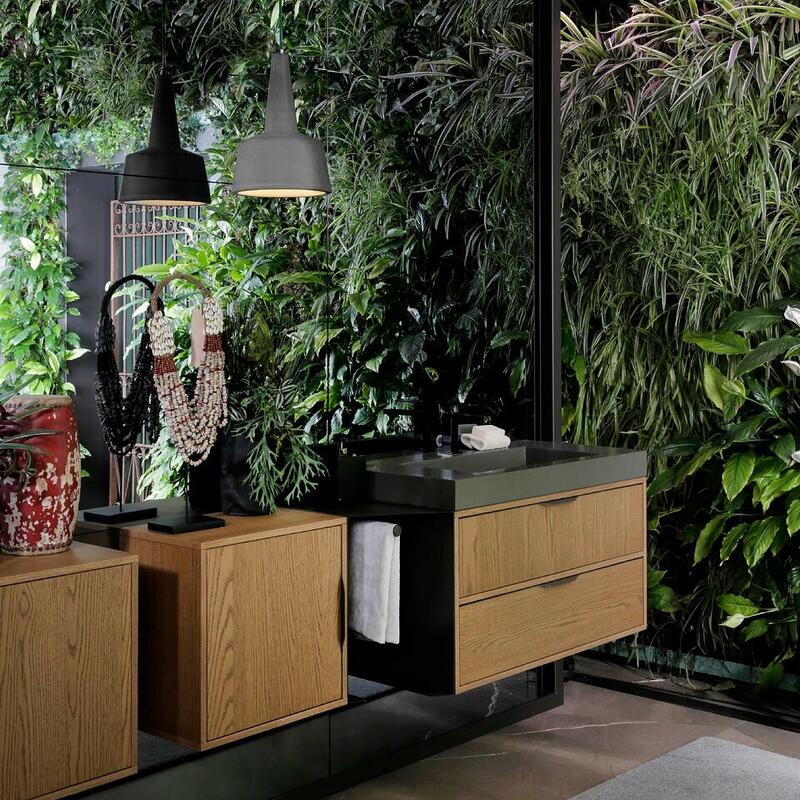 Lighting projects for the bathroom are reaching new frontiers of technological innovation thus ensuring greater efficiency and character of the lamps made. Each lamp has different aspects of design and practicality depending on the type of room and the atmosphere that the customer wants to create. 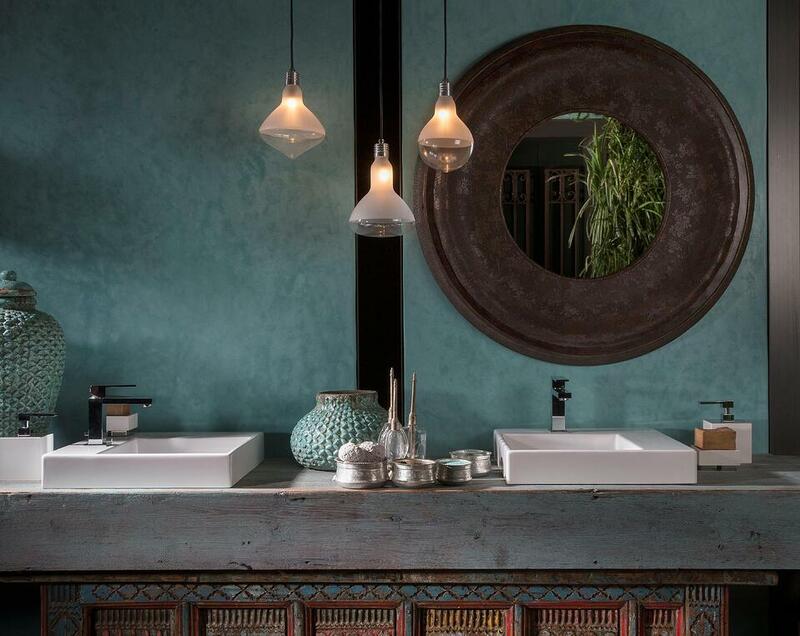 Create a bathroom lighting project that stands out for its style and functionality. We are sure it will be a success. For more information, support and assistance in correctly choosing impactful bathroom lamps, do not hesitate to contact us at this link. We are at your complete disposal.